Europe's Ariane 5 rocket accomplished its third commercial mission of the year Wednesday, delivering to orbit two African communications satellites to broadcast television programming and boost connectivity with rural villages. The 166-foot-tall launcher took off at 2059 GMT (4:59 p.m. EDT) and soared into partly cloudy skies over the French-run space base in Kourou, French Guiana. After turning east from the South American coast, the Ariane 5 rocketed into the upper atmosphere and shed its twin solid rocket boosters about 2 minutes, 15 seconds after liftoff. The rocket's hydrogen-fueled first stage consumed its propellant in 9 minutes and gave way to a cryogenic upper stage that ignited a few seconds later. The second stage burned for nearly 16 minutes, completing a high-speed transit of the Atlantic Ocean before deploying its two payloads in view of ground stations in Gabon and Kenya. Nilesat 201 separated just shy of the flight's 29-minute mark, followed by the jettison of the Ariane's Sylda dual-payload adapter less than 2 minutes later. The second stage released Rascom-QAF 1R less than 33 minutes after launch. Both satellites were dropped off in an elliptical transfer orbit stretching from 154 miles to a peak altitude of 22,322 miles. The orbital inclination was 2 degrees. "It is the 38th success in a row for Ariane 5, and since the beginning of 2010, we have launched six major telecommunications satellite, which is more than all of our competitors together," said Jean-Yves Le Gall, Arianespace's chairman and CEO. Each spacecraft is beginning several weeks of orbit-raising engine firings, critical deployments, and testing before they are handed over to operators in September. Both satellites were built by Thales Alenia Space of France. 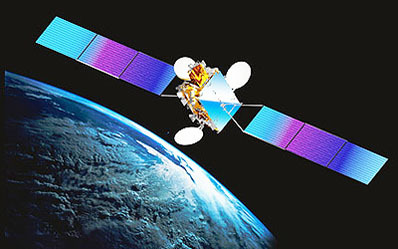 Nilesat 201 will enter service at 7 degrees west longitude, joining two other Nilesat spacecraft and a European-owned satellite to provide direct-to-home television, radio and broadband Internet services to Africa and the Middle East. "It will play an important role in the dynamic broadcasting and emerging global markets in the Middle East and North Africa," said Reynald Seznec, CEO of Thales Alenia Space. "It is fitted with powerful state-of-the-art Ku-band and cutting edge Ka-band technology." 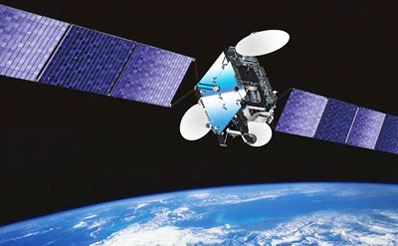 The satellite carries 24 Ku-band and four Ka-band transponders for Nilesat, Egypt's state-controlled telecommunications company. "I would like to congratulate the team of Nilesat for the successful launch of Ariane 5 and Nilesat 201," said Anas El Feky, Egypt's information minister. "We are truly proud of what you achieved tonight. It's a great achievement for the Egyptian media and added value to the Nilesat company, which has been very successful in our region." Rascom-QAF 1R was ordered to replace a nearly identical satellite crippled by a helium leak after launch in 2007. The glitch forced the first Rascom-QAF satellite to burn more propellant than expected, reducing its useful life from 15 years to two or three years. "Two-and-a-half years ago, we were just witnessing the launch of the first satellite," said Faraj Elamari, CEO of RascomStar-QAF, an African satellite company. "Well, we had to do it twice. It look a lot of determination and our motivation hasn't changed." RascomStar-QAF was founded by a consortium of African and European investors, including Thales Alenia Space, a Libya-based investment fund, and RASCOM, a satellite communications organization with members in 45 African nations. "This is a big day before us because we have been on the journey for the Rascom project right from the start as one of the shareholders and also as prime (contractor) for the satellite," Seznec said. Rascom-QAF 1R will be stationed at 2.85 degrees east longitude with 12 C-band and eight Ku-band transponders, beaming television, telephone and Internet services across Africa. "Thanks to Rascom-QAF 1R and its associated ground equipment, Africa will be able to benefit from communications in rural areas at an affordable cost, communications between regional capitals and cities, and between cities and villages," Elamari said. According to Elamari, Rascom-QAF 1R will help connect up to 150,000 rural villages to communications networks. In remarks following Wednesday's mission, Le Gall announced two new contracts for Arianespace. The company will launch the GSAT 10 satellite for India and the Intelsat 20 communications craft covering the Asia-Pacific region. The company has a backlog of 22 Ariane 5 launches and 17 flights of the Soyuz rocket, which will make its first launch from Kourou in December or early 2011. 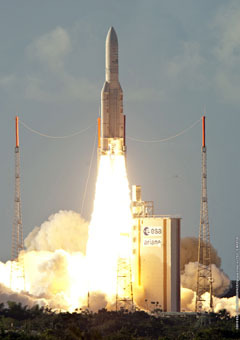 The next Ariane 5 mission is scheduled for Sept. 15 with European and Japanese payloads. Another dual-satellite launch will follow in October or November, and Arianespace will wrap up 2010 with the delivery of an unmanned cargo ship for the International Space Station.